With High-Qualified zinc, this Ello&Allo Wall-Mounted Towel Holder creates a LIGHT duty design to HELP YOU save space and OFFER YOU convenience while mopping. 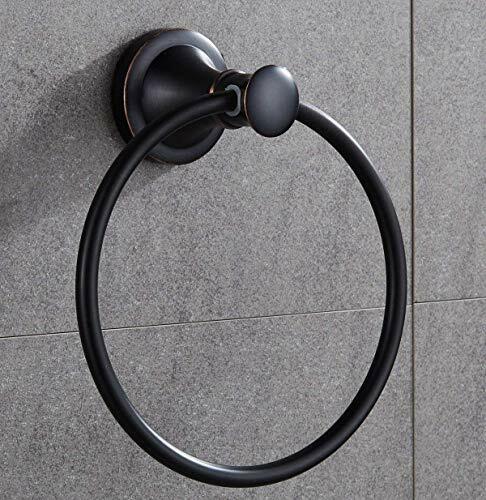 Towel Ring (1 piece), Mounting accessories. 2. There might be slight color difference between pictures displayed and the arrival due to light and pixel. Limited Lifetime Manufacturer's Warranty. Or You can directly contact us, when it occurs to quality issue. We are Factory Proprietary Store,Providing Best Price and Customer Service.Purchase now "Add to cart" with no hesitate. There's nothing worse than washing your hands and not having a hand towel close by to dry off. With the ELLO&ALLO towel rings, it's so easy to keep them at arms reach right next to your sink. Design inspired by the beauty and bliss of ocean waves, will add quality hardware accessories to your bathroom with coordinating 18" and 24" towel bar, robe hook, towel ring, and toilet paper holder options, and is available in Venetian Bronze finishes. Towel ring will keep hand towels off of the counter in a powerful venetian bronze finish. If you have any questions about this product by Ello&Allo, contact us by completing and submitting the form below. If you are looking for a specif part number, please include it with your message.